The Ontario Organic Awards recognize and celebrate innovation in organic agriculture in Ontario. 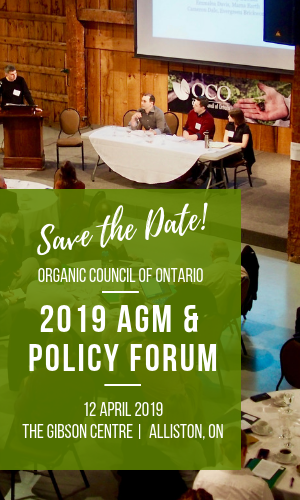 Awards are given to individuals and businesses which show consistent and pioneering efforts within Ontario’s organic sector. OCO board member Michelle Schmidt and OCO Executive Director Jacob Pries present Jenny Butcher with the Outstanding Volunteer or Education Award. Gift basket provided by Goodness Me! Minister of the Environment and Climate Change, Glen Murray and Organic Federation of Canada President Ted Zettel present Tomás Nimmo with the Lifetime Achievement Award. Gift basket provided by Whole Foods.